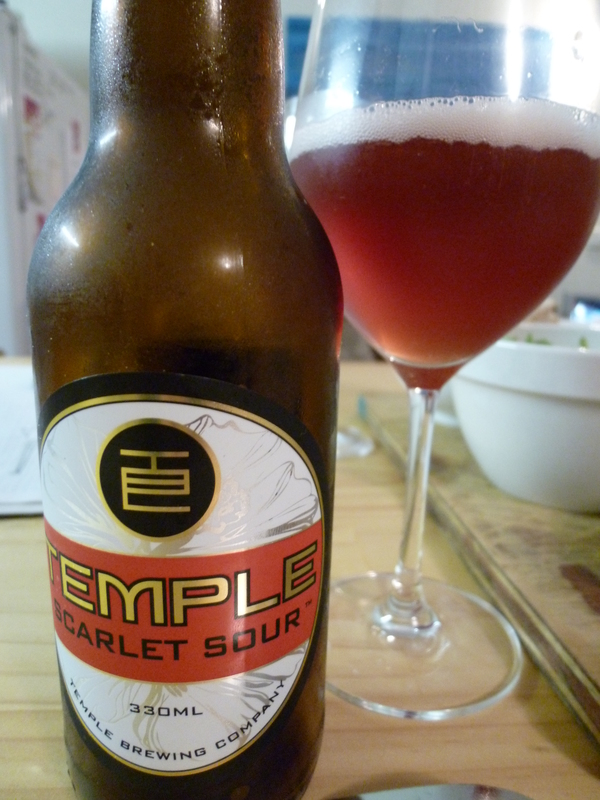 I had a bottle of Temple Scarlet Sour in the fridge and it was just dying to come out and play. Since I have a bit of a love affair going on with Temple, i.e. I’ve loved all their beers I’ve tried so far, I wanted to do something special with it. I took to Twitter to seek advice on food matching with Scarlet Sour. I couldn’t serve up fruit for dinner, as much as I love fruit my partner remains unconvinced. I contemplated serving up cheese as a main meal but decided this was a slippery, heart stopping slope I should not venture down. 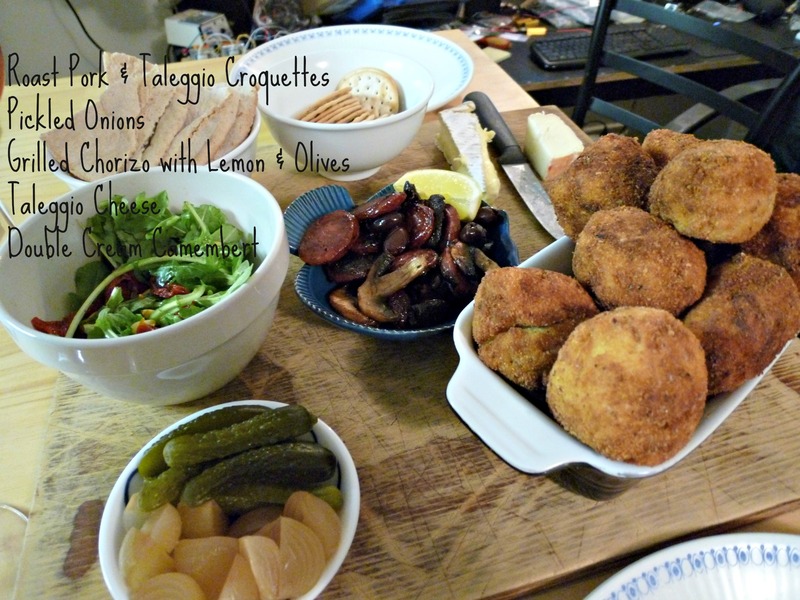 In the end I decided on pork and taleggio croquettes and turned it into a bit of a tapas style meal. With the exception of the chorizo and salad, all foods were picked in the hope they would match with the Temple Scarlet Sour based on Twitter responses. But first, the beer … Much softer than I had expected, I had it in my head it would be lip puckering sour but it wasn’t the case. The colour was beautiful soft pink, like it was embarrassed, with aromas of berries, flowers and a little herbal too. The sourness was very soft, more of a suggestion, and just lightly carbonated with nice cranberry flavours going on. It would be a good introductory beer into exploring the sour side of the beery world. 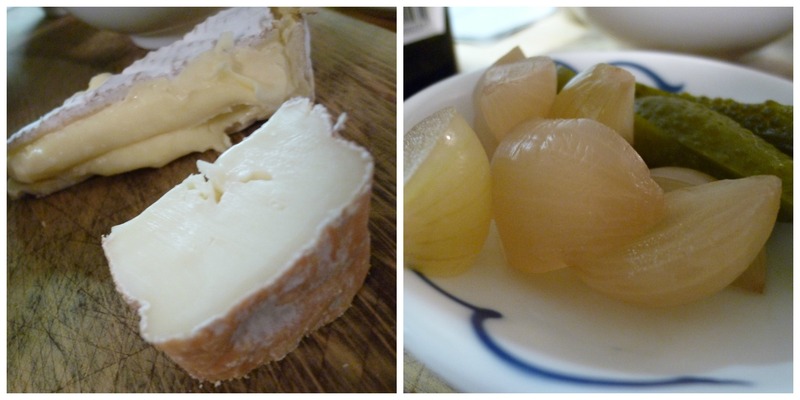 The best matches were the taleggio cheese and surprisingly, the pickled onions. I love learning about a new cheese almost as much as a new beer and I had no idea what this cheese was. Assuming you’re a taleggio-virgin too, it’s an Italian cows milk cheese washed in seawater once a week to prevent mould infestation. I instantly loved the taleggio with its fantastic rubbery texture and mushroomy, dusty rind. Though the aromas are pretty big the flavours are soft, mild and fruity. It made for a nice compliment to the delicate floral notes in the beer. The very surprising match of Scarlet Sour and pickled onions was actually really simple – sweet, sour and tangy all working together. 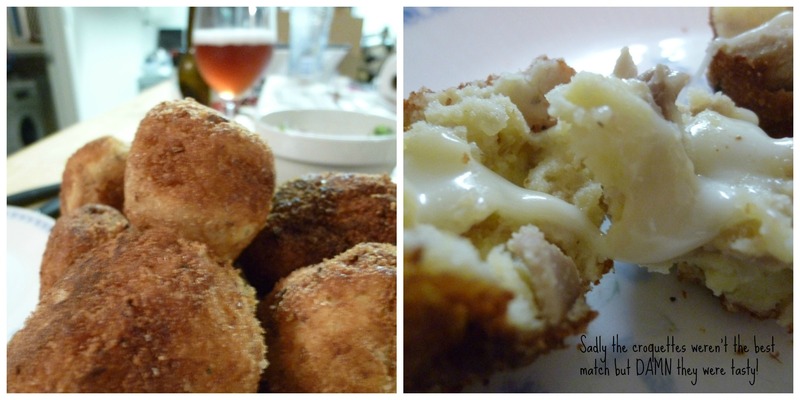 It was a nice reminder that sometimes food and beer matching is really very simple, especially a good reminder for me given my tendency to over complicate things and go over the top … but for the record, whilst the croquettes were not the best match they were definitely worth the effort. Note: Since writing this post Temple Brewing have announced their voluntary liquidation through this statement. I sincerely hope they are able to return to their dream of brewing exceptional beer soon.